Virgin Galactic's VSS Unity vehicle on the ground in Mojave, California, after a successful "glide flight" on Jan. 11, 2018. Virgin Galactic's second SpaceShipTwo vehicle has taken to the skies once again. The spacecraft, known as VSS Unity, completed its seventh unpowered "glide flight" today (Jan. 11) over Mojave, California, Virgin Galactic representatives said. "Today we tested that work by pushing Unity’s atmospheric capabilities hard, touching top-end glide speeds as pilots Mark 'Forger' Stucky and Michael 'Sooch' Masucci completed a busy test card," Virgin Galactic wrote in an update today. As that note indicates, SpaceShipTwo is designed to be carried aloft by a specialized airplane. During operational flights, the spacecraft will be dropped at an altitude of about 50,000 feet (15,000 meters), then boost itself to suborbital space using its own rocket motor. The passengers aboard — SpaceShipTwo can fit six paying customers, along with two pilots — will get to experience a few minutes of weightlessness and see the curvature of Earth against the blackness of space before gliding back down to Earth. Tickets to ride SpaceShipTwo currently sell for $250,000. To date, more than 600 people have put a deposit down for a seat, Virgin Galactic representatives have said. But VSS Unity will have to ace some powered flights before it can start taking customers and research payloads to suborbital space. 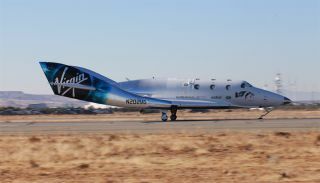 The company is laying the groundwork for powered tests: During today's flight, Unity carried water ballast to simulate the rocket motor's weight, and it was outfitted with a thermal protection system, which will shield the spacecraft from the heat and friction of atmospheric re-entry, Virgin Galactic representatives said. Unity is Virgin's second SpaceShipTwo vehicle. The first, VSS Enterprise, broke apart during a rocket-powered test in October 2014. The tragic accident killed co-pilot Michael Alsbury and injured pilot Peter Siebold.